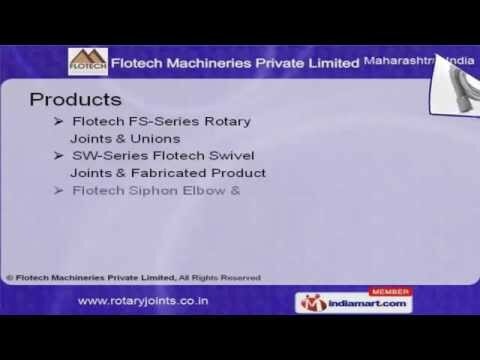 Welcome toÂ FlotechÂ MachineriesÂ Private Limited, Manufacturer and Exporter of Rotary Joints, Union and Accessories The company was incorporated in 1995 atÂ NaviÂ Mumbai. Â RIL, Â ITCÂ andÂ JKÂ tyres are some of our elite clients and we serve to Chemical, Petroleum, and Tyre Industry. Excellent after sales supports, Superior raw materials and customized packaging units are the reasons behind our success. We offer a wide variety of Recommended Flexible Hose Length, SW SeriesÂ FlotechÂ Swivel Joints and Fabricated Products. OurÂ FlotechÂ FSÂ Series Rotary Joints and Unions are appreciated amongst our clients for superior quality. SW SeriesÂ FlotechÂ Swivel Joints and Fabricated Products are highly efficient. We also provide Flexible Hose andÂ FlotechÂ Siphon Elbow that are widely acclaimed in the market. Along with that we offer Recommended Flexible Hose Length at market leading prices. Our company is specialized in Determining Siphon Pipes Length with Siphon Elbows.